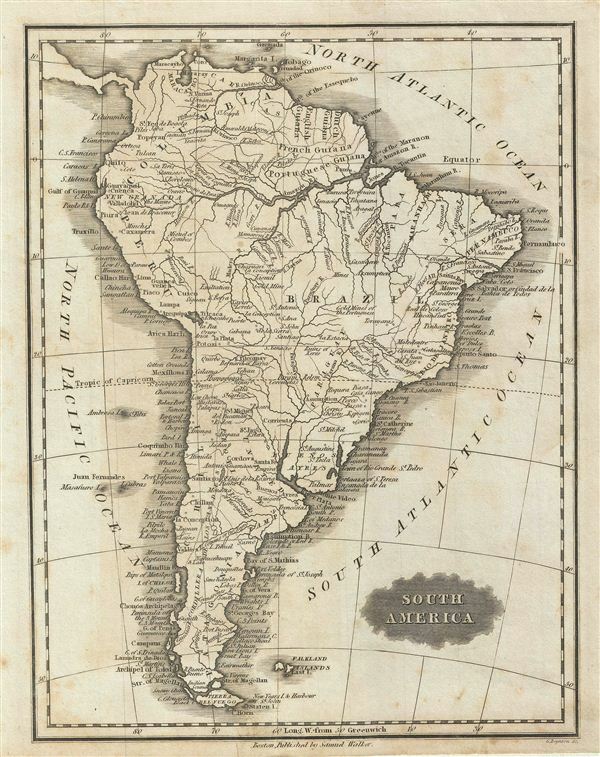 This is an attractive example of the 1828 Malte-Brun map of South America. The map covers the continent in its entirety from the Caribbean to Cape Horn, including the Falkland Islands. Various, important rivers, islands, cities and other topographical details are noted. This map was published by Samuel Walker in 1828 as part of the American edition of Conrad Malte-Brun's System of Geography, Vol. I.
Conrad Malte-Brun (August 12, 1755-December 14, 1826) was an important late 18th and early 19th century Danish / French cartographer and revolutionary. Conrad was born in Thisted, Denmark. His parents encouraged him to a career in the Church, but he instead enrolled in the University of Copenhagen. In the liberal hall of academia Conrad became an ardent supporter of of the French Revolution and the ideals of a free press. Despite the harsh censorship laws of crown prince Frederick VI, Malte-Brun published numerous pamphlets criticizing the Danish government. He was finally charged with defying censorship laws in 1799 and forced to flee to Sweden and ultimately France. Along with colleague Edme Mentelle, Malte-Brun published his first cartographic work, the Géographie mathématique, physique et politique de toutes les parties du monde (6 vols., published between 1803 and 1807). Conrad went on to found Les Annales des Voyages (in 1807) and Les Annales des Voyages, de la Géographie et de l'Histoire (in 1819). He also founded the Paris Société de Géographie . In time, Conrad Malte-Brun became known as one of the finest French cartographers of his time. His son Victor Adolphe Malte-Brun (1816 - July 13, 1889) followed in his footsteps, republishing many of Conrad's original 18th century maps as well as producing numerous maps of his own. The Malte-Brun firm operated well into the 1880s. Malte-Brun, M., System of Geography, Vol. I. (Boston; S. Walker), 1828. Very good. Blank on verso. Original platemark visible. Overall toning.